received by January 30, 2017!! 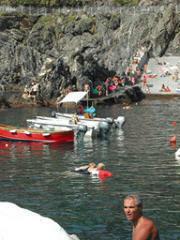 During the week we will visit the Cinque Terre and we will stay at Pensione Sorriso* in Vernazza. We will also visit the villages of Riomaggiore, Manarola and Monterosso with quality time for plenty of painting at each of the towns we visit. And, in true Toscana Americana Workshops style, we will explore the local Italian culture, cuisine and wines while dining in local restaurants never far from the waters of the Tyrrhenian Sea! This is bound to be a wonderful week with plenty of opportunity to paint "plein air" in a relaxed and inspirational setting! Through demonstrations and individual instruction, Sandy will guide participants through a process designed to help obtain greater confidence and pleasure from painting outdoors while improving artistic vision and skill. Participants will enjoy morning and afternoon sessions. Participants are required to provide their own art supplies, preferred paints, brushes & tools. Workshop is open to painters of all levels. Whether you are a novice just learning to mix color, or a professional needing advanced problem solving, Individualized and group instruction will address needs at your level and push you to the next step in your personal development. Note: Accommodations may change based on availability. US$3740.00 per person single occupancy. *All-inclusive plans are Hotel plans only. ...we suggest to pack light. 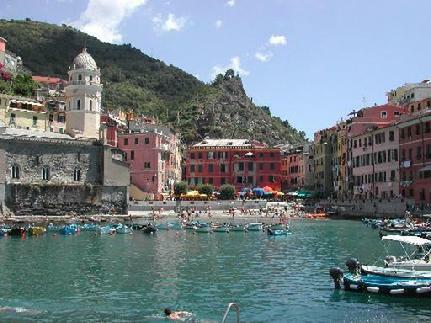 Pensione Sorriso is the only accommodations in the quaint village of Vernazza that can accommodate groups such as ours. It is located near the train station and just a 3-minute walk to the harbor. Rooms, typical of such a small village, are quaint with private bathrooms (no hair dryers, but they are available to use from the reception desk). No elevator is available. Typical electrical items from the United States, for example, wil not function and may burn-out. Voltage reducers are suggested to be bought before your trip and will aid while you travel throughout Europe. An adapter (not to be confused with a voltage reducer) for the electrical outlet is also a must for items such as cell phone chargers and computer use. NOTE:Toscana Americana reserves the right to alter this itinerary. All times are approximate. 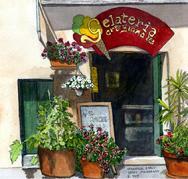 NOTE:Travel from Vernazza within the Cinque Terre towns is by train and/or boat. Depending upon weather, timetables, etc. NOTE: Walking is required to all painting locations, lunches and dinners. No transfers are provided, though guests may pay for taxis and transfers at their own expense. NOTE: Guests are responsible for handling their own luggage. We suggest to pack light. Luggage not needed in Vernazza may be stored, for a fee, at the checked-baggage counter at the Santa Maria Novella train station, found alongside track 16. See more photos of the Cinque Terre! click the icon to the right! Welcome to my Workshop. I want you to have the time of your life and collect memories you will never forget. With this in mind I encourage you to work in Watercolor Journals rather than trying to create a larger watercolor painting. In a journal you can not only create lovely little watercolor paintings, but write about our adventures. When you return from your trip you will have hundreds of photos to paint larger paintings from in your studio and your wonderful book of watercolor memories and stories to re-live your adventure. If you go to my website www.sandydelehanty.com and click on the PLEIN AIR page you will find pages from my watercolor journals on previous trips. 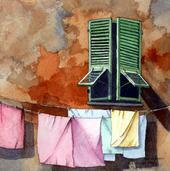 Below them you will see 6" x 6" watercolor paintings also done out doors on painting trips. Our painting sessions will be spent out of doors in lovely ancient villages, sitting on campstools or folding chairs capturing beautiful views in watercolor journals. We will be walking on cobblestones and old stone stairways, finding a shady spot to sit with a view we love, and painting in our journals. Of course our cameras will be at the ready as we walk through the villages and while we are painting so we won't miss a shot. We will be carrying our own gear and each painting session will last a couple of hours. We will meet our hosts at the restaurant they have chosen for us to enjoy lunch. After a delicious lunch I will lead another painting session, but if you want to skip out and go shopping or exploring that is fine too. My teaching style is very one and one and that is why I like small group painting trips. Please keep in mind that cobblestones can be slippery and stones are hard on the feet so wear shoes with thick rubber soles with a pattern for gripping, and carry your stuff in a backpack not a shoulder or shopping bag. With a backpack you are balanced and your hands are free to carry a camp stool in one hand and grab a railing with the other. I don't want to be picking you up off the cobble stones! No purses when you go out to paint please. Money, ATM, or credit cards should be in a money belt under your clothes, not in a purse. A couple of coins for an ice cream cone is OK in a pocket, but remember all valuables should be under your clothing or in the hotel safe and this is true no matter where we travel in the world these days. I want you to be safe and have fun. Never leave home without your camera and business cards! Digital cameras eat batteries always pack your battery charger, extra batteries and an extra storage disks. Business cards are handy to give to people you meet that you want to keep in touch with. Backpack My backpack is the Civita Day Pack $1995. from Rick Steves website. I have traveled with it for 8 years and thrown it in the washing machine countless times. Whatever backpack you choose it should have two outside pockets designed to carry water bottles, one for drinking the other for painting water. We will carry our art supplies (which are small if you follow this list) camera and extra batteries, water bottles, fold up rain coat, lipstick, Kleenex etc. all in this back pack as we go out to paint each day. My camp stool folds up so small it fits in my backpack, but if your stool does not fit you will need to carry it in one hand. But since you have a backpack for your gear you still have a free hand for holding on to railings etc. My camera is always around my neck ready to shoot a photo at a moments notice. Folding camp stool please sit on it before packing it to make sure it is comfortable for a couple of hours of painting. Measure your suitcase before shopping then search on www.eBay.com, or go to camping equipment stores. Warning: My camp stool only works for short legged people like me. I searched on eBay for "folding camp stool" and found "SMOKEY BRANCH CAMOUFLAGE FOLDING CAMP STOOL" from Patriot Surplus. When I bought it 8 years ago it was $9.95 eBay item number 8755516383. It looks like it was designed for sitting in a hunting blind! Palette with Paint Purchase one of the tiny travel palettes pre-filled with half-pan solid watercolor paints. Prices range from $35. or so to around $125.00 depending on the quality of the paint. Winsor Newton and Holbien have great paint. Cotman (the cheaper version of Winsor Newton paint has filler in it) and is priced around $35. I have had students make their own travel palettes by buying a tiny plastic palette with lid and wells and squeezing tube paint in the wells. The problem with this is tube paints get sticky when it is hot and stick to the lid and brushes and get really messy. Brushes The travel pallet sets, mentioned above, come with a small round brush. To that I add a larger round travel brush and a flat brush, a ¾” or 1” Winsor & Newton Sceptre Gold II Short handle series 606. I also bring a stiff brush, the da Vinci Top Acryl #2 item # 7185K, which I use for lifting. Available at www.MadisonArtSupply.com. masking fluid and pick up tool (only if you use it). I like Daniel Smith squeeze bottle brand, call them at 1 - 800-426-6740 if you cannot find it on their website. Paper: As stated above I prefer to create a Watercolor Journal of my trips in a bound travel book of watercolor paper. Several brands and sizes are available in catalogs and at University Art in Sacramento. Just make sure your book has paper for watercolor not for sketching. The sketch books are made for dry media and do not work well with watercolor. I like Arches and Dale Rowney brands myself. Or you can use a packet of 4” x 6” watercolor postcards, or cut 300 lb sheets of your favorite watercolor paper into 5" x 7" or 6" x 6" etc. and put them in a zip lock plastic bag, or use a small watercolor block (but remember they are heavy and you cannot use the next page without removing the top page). Note: Do not pack prohibited items in carry-on luggage! They may be confiscated.